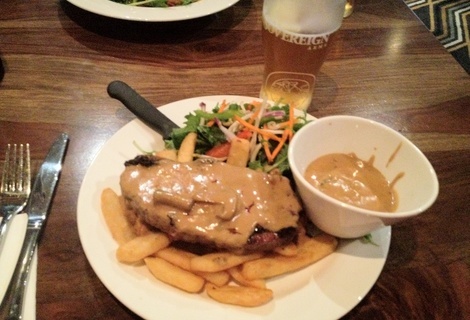 Joondalup's new age British pub - Good pub food and friendly service. 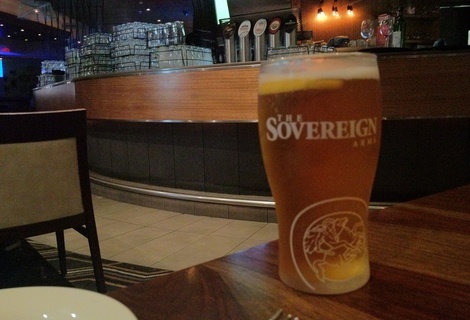 The Sovereign Arms was reviewed on Thursday 13th December 2012 18:56 by Richard. There's a raft of 'new age British pubs' opening up in the far northern suburbs of Perth recently, quite a few owned by the same group, The Whale and Ale in Clarkson, The Cornerstone in Butler and The Sovereign Arms in Joondalup. A good mate and I popped into the latter for a beer and a meal before watching a movie next door. 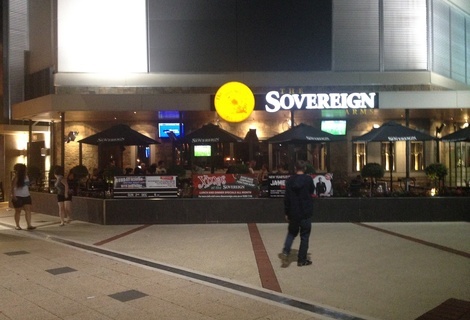 The Sovereign, or 'The Sov' as the locals call it is a modern style British pub located just outside The Lakeside shopping centre in Joondalup. The pub is a lot bigger than it looks from the outside, there's a large outside area, a sit-down dining room and of course a bar section. We ordered a couple beers at the bar and chose a spot in the dining area/restaurant to have our meals. There's a fairly good selection of beers on tap and I was stoked to see they had one of my favourite euro beers on tap, Kronenbourg. Service all round was great, bar staff were friendly and the waitstaff in the restaurant were just as good. Full table service is provided in the restaurant which was a nice change from the 'order at the counter and wait for your buzzer to go off' method so many pubs use today. Although advertised as a British pub, there's nothing overly British about it, except if you count the Night in Shining Armour statue you're greeted by as you walk in the front door as being British. Not that it's a bad thing but I don't think it resembles any of the pubs I visited on a recent trip around the UK. The menu however leans towards being British, with a good selection of pub classics like steak and ale pie and bangers and mash. I probably ordered the most un-British thing on there, the salt and pepper squid salad and my mate ordered the sirloin with mushroom sauce. Both meals came out within 20 minutes and were both quite good. 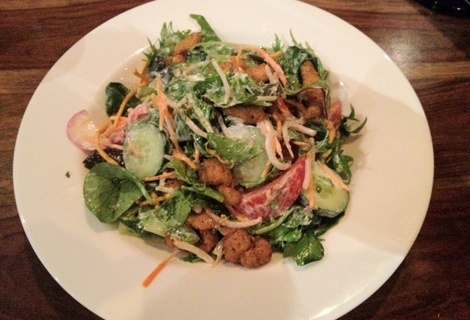 The salad was huge and had plenty of tasty squid in it, very decent as far as salt and pepper squid goes. The steak however was the winner, cooked exactly how it was ordered and plenty of creamy mushroom sauce. I helped myself to a few of my mates chips to taste the sauce and I'd have to say its one of the best mushroom sauces going around, the chips were very decent too. Overall our meals and a couple of pints came to a smidge over 70 bucks, quite good value given the quality of the meals and the friendly service. The next time you're doing a spot of shopping at Joondalup do yourself a favour, give the food court a miss and head to The Sov for lunch instead. Dress code applies after 7pm. Neat and casual attire; No thongs, workboots, hats, boardshorts or "hoods" on jumpers or jackets permitted. 7/10Bailey Bar & Bistro in Joondalup, WA (238m away)Standard suburban pub - family friendly with a decent food selection.